Bats: The New Canary in the Coal Mine? At least 1 million bats in the past three years have been wiped out by a puzzling, widespread disease dubbed "white-nose syndrome" in what preeminent US scientists are calling the most precipitous decline of North American wildlife in human history. If it isn't slowed or stopped, they believe bats will continue disappearing from the landscape in huge numbers and that entire species could become extinct within a decade. This would have drastic repercussions for the rest of us. As Tim King, a conservation geneticist with the US Geological Survey in West Virginia, told Chase, "We're at the vanguard of an environmental catastrophe." Why? Because bats are insect-eating machines, capable of consuming nearly half their body weight in insects each night. Take them out of the equation and we'll have an explosion of pests, including disease-carrying mosquitoes and agriculturally destructive beetles, moths, leafhoppers and other foes of the farmers, who may be forced to use more pesticides as a result. Bat colonies in Massachusetts, New York, and Vermont have averaged a shocking 94.5 percent decline since white-nose syndrome was first detected there in 2006, plummeting from 48,626 bats to 2,695. The disease's spread "has been terrifyingly swift," according to the Globe, starting in the Northeast and South Atlantic states and now infiltrating "caves and mines in Kentucky and Tennessee, and possibly North Carolina and Ohio." But, unlike colony collapse disorder, the highly publicized disease that's destroying our bees, white nose syndrome isn't getting much attention. As Susi von Oettingen, a biologist who works for the US Fish and Wildlife Service, noted, "They're not charismatic. . . . We don't make money off of them. They are not cute and cuddly." 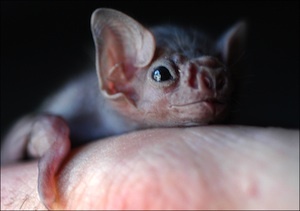 Let's face it; even baby bats aren't all that adorable. Julia Whitney Barnes, a New York artist, did her best to glamorize these critical but creepy critters last year by hanging over 30 life-sized, gold-plated ceramic bats from a willow tree on Brooklyn's waterfront. 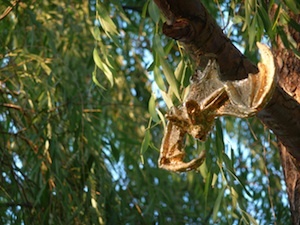 The installation, entitled "Gilded Phytophillic Bats," was intended "to raise awareness of the mysterious environmental problem causing widespread death in many bat colonies," Barnes explains on her website. By gold-plating the bats, Barnes hoped to express "the precious role bats play in our ecosystem" and counteract the perception of bats as being "dangerous or grotesque." Bats have long been feared and misunderstood in our culture, with their fang-filled faces and freaky flying ways. But a future without them is the real horror, and it could happen if we don't give our scientists and agencies sufficient resources to combat white nose syndrome. Efforts to solve the mystery so far have been hampered by a lack of funding and coordination, as Chase reported. This past June, US House subcommittees held hearings on the mysterious deaths, and $3.3 million has been allocated so far to study the disease. An additional $1.9 million for research on white nose syndrome was earmarked in a recent appropriations bill for this fiscal year. But these amounts fall far short of what scientists and wildlife managers need to tackle the problem. In a budget request prepared for Congress, Thomas Kunz, a bat biologist from Boston University, estimated that $17.6 million is needed this fiscal year, and $38.3 million more over the next four years, to conduct essential research, surveillance, and management. This is more than just about bats dying. It's about a key player in our ecosystem disappearing before our eyes. It may be a model for the severity of diseases that our native species are going to be confronted with. If it's frogs yesterday, bees two days ago, bats today, and something else in two more years, how long before this system falls apart on us?